If you are in love with animal print, especially with Leopard print, our Brown Ladies Leopard Print Faux Fur Newsboy Hat is just for you! Crown of this hat offers extremely soft and smooth touch and bill of this newsboy hat is knitted material. This smooth crown of hat has fur like touch with leopard print on it. With fully lined inside, this winter style newsboy hat is designed to cradle your head in coziness and comfort and this hat will offer you luxurious look in animal print design. 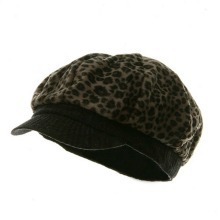 Ladies are likely to wear this leopard print newsboy hat for any of their outings. Made of 97% polyester and 3% spandex.